Needlework crafts, quilting, cross-stitch, sewing, recycling, crochet, knitting, macrame and other fabric and thread crafts. Thanksgiving is over and it's time to get your Christmas crafts for display or gifts. If you have rolls of inexpensive ribbon you've accumulated from sales, thrift purchases or auctions, you may be surprised that this is the year you can use them for crafts projects. They don't just wrap the gift, they are the gift. You can make a pillow or tree ornaments or even a purse. 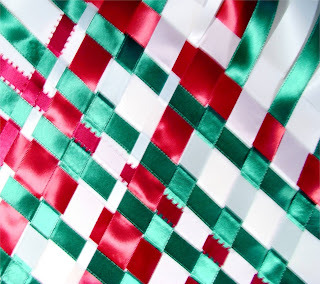 Here's how to make the ribbon fabric to make gifts of your choice. Foamcore or smooth cardboard a little larger than the item you want to make. Cut the foamcore (like poster paper with foam center) or cardboard to a square size you can use for your project. If you want to make a large item such as a pillow, a 20 by 20 inch square will do, but if you want to make a Christmas ornament, a 10 by 10 inch square is a good size to start. Cover the board with Heat n Bond, Stitch Witchery or Wunder Under -- any kind of bonding fabric that will attach to the ribbon with heat. A large board will require more than one piece of bonding material. Attach the bonding with clear tape at the back of the board. Make it secure, but don't let it wrinkle. Match two pieces with no overlap, just butting the bonding together. Don't tape on the front -- just on the back. Use a ruler to mark all sides of the covered board at 1-inch intervals. These are your guidelines for your design. Choose how you want to make the design -- you can do a diagonal or a square. Either one will work with the 1-inch marks. Cut ribbon in lengths at least 2 inches longer than your board. Start in the middle and place a few ribbons horizontally or diagonally across the board, using the measurements as a guide and securing it with a straight pin on each side. I pushed the pins from the side to the back so they wouldn't be in the way on the front, but work with your board to see what works for you. Weave a few ribbons vertically or diagonally through the horizontal or diagonal ones, not overlapping and not leaving any gaps. If you're working with a white bonding fabric and white ribbon, watch for spaces at the corners of the crossing ribbon. Continue weaving over and under until you get a piece of ribbon fabric the size you need to make your item. 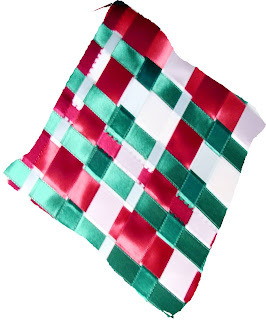 As small as 12 inches by 12 inches will make a pillow, but you can use smaller pieces of ribbon fabric for Christmas ornaments or the front of a purse for a Christmas gift. Once you have the ribbon woven on the bonding fabric and secured, you're ready to make the fabric. Follow the instructions on the bonding material -- it probably recommends a dry iron and medium temperature for 5 to 7 seconds of pressing. Allow the fabric to cool. Remove the bonding fabric from the board by removing the pins and releasing the tape on the back. Cut the shape you need for your project. I made a diagonal design that would make diamond shapes for tree ornaments, a pillow or purse front. Peel the paper backing off the bonding fiber so you have a flexible ribbon fabric. Stitch around the shape to keep all the ribbons in place. 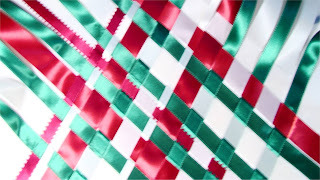 Use the ribbon fabric just as you would any other fabric, but reinforce it with a backing or lining for years of use. To make a diamond ornament like this, cut a backing fabric the size of your diamond. Place right sides together and stitch around the ornament, leaving an opening at the top to turn it and to add a hanger. Turn it right side out and close the opening with hand stitches or with the sewing machine, adding a ribbon loop for hanging. This doesn't take much time (or thought) and the ribbon fabric is easy to work with once it's made. All free needlework crafts sewing stitching patterns and instructions complete with articles and pictures for crafting fun. This blog accepts third-party advertising or other forms of compensation. The compensation received may affect the advertising content, topics or posts. That content, advertising space or post may not always be identified as paid or sponsored content. The owner of this blog is not compensated to provide opinion on products, services, websites or other topics. All views and opinions are those of the owner. If we claim or appear to be experts on a certain topic or product or service area, we will only endorse products or services that we believe, based on our expertise, are worthy of such endorsement. Any product claim, statistic, quote or other representation about a product or service should be verified with the manufacturer or provider. We have a financial interest in the following that are relevant to our blogging: Third party advertising through Google and Amazon.